The Napa Vintner Stackable Wine Rack Quarter Round Display Wine Shelf is perfect for displaying decanters, champagne buckets, or fine wine accessories. These 3 and 4 shelf wooden units make a flowing transition from wine racks to the wall. Purchase two quarter round corner shelves to stack on top of each other to maximize the height of your wine storage. Assembly required. The Napa Vintner Stackable Wine Rack Quarter Round Shelf is perfect for displaying decanters, champagne buckets and fine wine accessories. This 4 shelf wooden unit makes a flowing transition from wine racks to the wall. 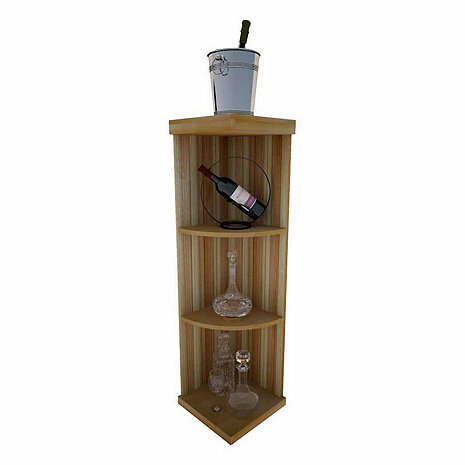 Purchase two to stack on top of each other to maximize the height of your wine storage. Moldings and platforms sold separately.